Monster Hunter 3 Ultimate has both straightforward online co-op and slightly unorthodox system link co-op. Here's a quick guide to get you hunting monsters and making clothes out of them with your friends. How many players can play Monster Hunter 3 Ultimate via system link or LAN? How many players can play Monster Hunter 3 Ultimate online? How do you begin a co-op session in Monster Hunter 3 Ultimate? 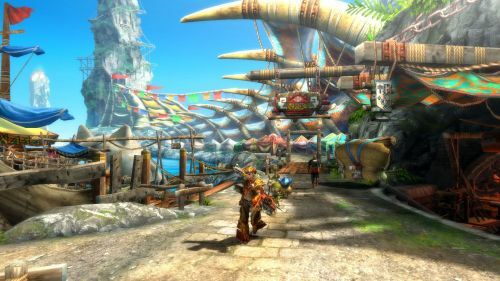 How does save game progress work for co-op play in Monster Hunter 3 Ultimate? Can I join a game if the host is further along than me in Monster Hunter 3 Ultimate? Up to four players can play via system link, either by linking four 3DS systems together or three 3DSs and one WiiU. For cross-platform system link to work, the WiiU player must act as host. Up to four players may play online together. From Moga Village, speak to Neko (the Felyne at the Harbor) to travel to Port Tanzia (Multi) if you'd like to play via system link. From there, players select quests from the Hunter's Guild and party up via the Quest board. Once everyone is ready, depart on the ship to begin. If you want to play online, ask Neko to take you Online - from there, you will select a World (worlds are capped at 1000 players) and create a Room for other players to join, or hop into an existing room. From there, it's the same process as system link. Each player retains whatever rewards they've earned in co-op hunts. If your Hunter Rank isn't high enough to take on advanced quests, you cannot access them. However, you may co-op with advanced players on any quest that you actually have the HR to take on. Page created in 0.3576 seconds.